Phlebotomy Career Training is pleased to now offer their Dialysis training program online. The online dialysis does require that students have some prior experience in health care, such as CNA, direct care workers, home health aide, etc. Students taking this class should know how to take vital signs such as BP, pulse, respiration. Upon enrollment, students will be given access to their class online. Each student is provided an instructor who will reach out to the student and help them with their course studies. Hard copy materials will be mailed out within 5 days of students purchasing the course online. Please call our offices at 734-762-3220. Dialysis technician will learn about the dialyzer machines and their operation. Patients’ who are in need of dialysis are in last stage renal failure. End stage renal failure is a very serious life threatening event. Renal failure prevents the body from processing waste through the kidneys. The kidneys are responsible for filtering waste products from the blood such as urea and nitrogen in addition to other waste products. Kidney filtration is responsible for stabilizing the blood. 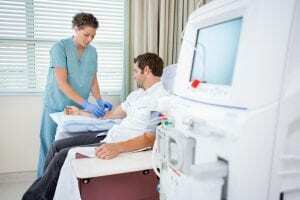 Patients who undergo dialysis have suffered damage to their kidneys from either prolonged high blood pressure or complications due to diabetes. Classes at our school are taught by Registered Nurses. The book that is used for the class is the standard hemodialysis study guide for national certification. The online dialysis does require that students have some prior experience in health care, such as CNA, direct care workers, home health aide, etc. Students taking this class should know how to take vital signs such as BP, pulse, respiration.